Are you the type of person who wants to surround yourself with works of art, and have reminders of creative endeavors everywhere? If you don’t already know how to make traditional pieces of art, it’s a pretty expensive endeavor and takes a long time to teach yourself (definitely try it though because it’s fun!). What if you could make whatever you wanted out of almost any kind of material or improve the visual quality of things that you already have with little more work than having an idea? 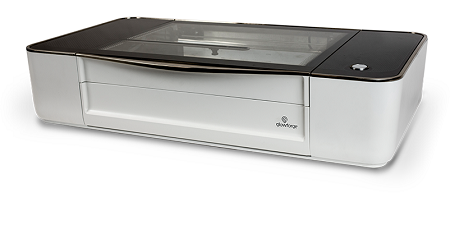 The GlowForge will let you do all of that and more, as this is a 3D Laser Printer that built its design off of laser cutter and engraver technology. This means you can not only cut out a design, but engrave on top of it as well, adding in whatever crazy details you can come up with. Yes, even a doodle of a stick figure can be engraved into wood, leather, acrylic, fabric, cardboard, or paper. I don’t know about you, but having a laser cutter/engraver with the precision to the breadth of a human hair is pretty impressive. The interior camera will show you on your computer screen where the design will land, and if it needs adjusting you can move it with a mouse or finger. Thanks to the lens that moves faster than the laser, materials that are irregular or curved will still be cut appropriately. It can also detect materials, so your iphone or laptop can be engraved without fear that they’ll be sliced in half. It connects to WiFi, works with most platforms and programs, and only needs to plug into a single outlet. While this would normally be $3,995, it’s presently $2,395 on pre-order. Happy creating!